1 Aqua Cal™ 16 oz. Multiple forms of bio active & bio available high purity calcium. Calcium is an essential major component / element / ion in natural sea water (NSW). Calcium is found at 400 parts per million (ppm) at 77F / 25C at a salinity of 35 parts per thousand (ppt) or a specific gravity of 1.026. Aqua Cal® is a unique blend of highly concentrated forms of pH balanced, bio-available™, and bio-active™ high purity calcium. 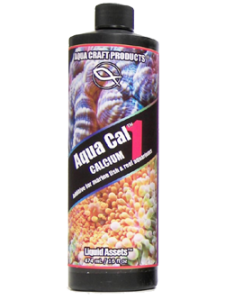 Aqua Cal® replaces various essential forms of calcium that are consumed by captive marine life in their normal metabolic process. Multiple forms of essential calcium are employed as they are found in NSW. Aqua Cal® is ideal to maintain and accelerate coral growth along with coloration and natural health. Maintain Ca at 400 ppm. for sea water duplication. Ideal for marine fish and various sea plants and algae. Maintain Ca at 425-460 ppm. for reef aquariums. Avoid adjusting calcium over 460 ppm. Prior to adding Aqua Cal®, test for alkalinity and magnesium. When used with ACP™ #2 & #3 will maintain the critical balance with magnesium and carbonate hardness (alkalinity). Calcium should be in balance with: alkalinity (carbonate hardness), magnesium (Mg++), SO4-- (sulfate), K+ (potassium) and pH. Alkalinity must be between 6-9 or 2.14-3.21 meq/L. Magnesium must be between 1290-1350 ppm. Test for other major ions and adjust if necessary only with ACP™ #4 and #5. Aqua Cal® has no ammonia, phosphates, nitrites, nitrates, silicates, heavy metals or unwanted undesirable contaminates. Aqua Cal® is available in 16 ounce / 474 ml size that will treat 2500 US gallons / 2075 Imperial gallons / 9450 Liters of sea water. One cap (6 ml) will raise Ca 10 ppm. In each 25 US gallons of marine aquarium water. 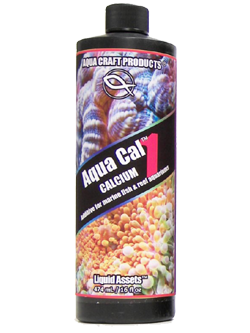 Aqua Cal® is also available in 1 gallon size for treating 20,000 US gallons of marine aquarium water.